Hope, free from the Amish puppy mill for more than two years, gets excited when she hears the word "walk". If you will be home tonight, or have a DVR, you might want to check out the following shows. First at 10 p.m. on Animal Planet is a story about dog hoarding. I realize shows like these hurt us to watch, but one of the dogs removed is in foster care with a friend of mine associated with Schnauzer Rescue Cincinnati and Florida. http://www.schnauzerrescuecincinnati.org/ The dog’s name now is Candy, and my friend says she arrived nearly bald from flea allergies. She is recovering. At 11:35 p.m. on ABC’s Nightline will be a story about Amish puppy mills. If you miss it, you can view episodes on the website at http://abcnews.go.com/Nightline/. Puppy mills are evil. What surprises many people is mills are big business for the Amish. The Amish treat dogs worse than livestock. Dogs are warehoused in cages, receiving little medical care. Many never have had their feet touch the ground. Regular readers of this blog know about Hope, who spent five years in an Amish puppy mill. When she could no longer produce litters, she was to have been shot and thrown into a ditch. 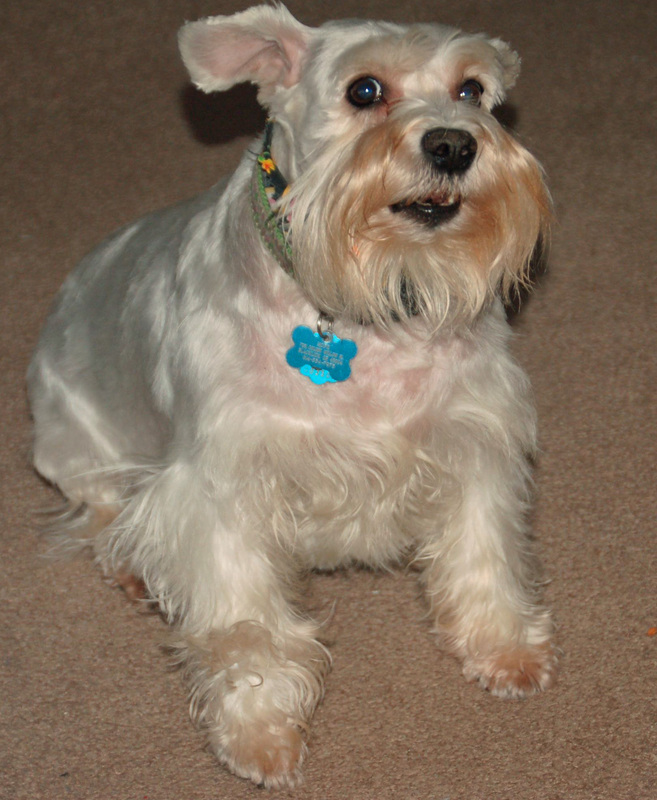 A wonderful woman from Schnauzer Rescue Cincinnati saved her. Hope has been in our care since September 2009 and is improving. She has trust issues, and I am afraid those won’t go away completely. We love Hope but some day would like to see puppy mills gone forever. This entry was posted in Animal Hoarding, Puppy Mills, Schnauzers and tagged Amish, puppy mills, Schnauzers. Bookmark the permalink.